Today is Election Day, and we have been working hard all year to make sure that Black communities across the country have the information and resources that they need to turn out and vote. 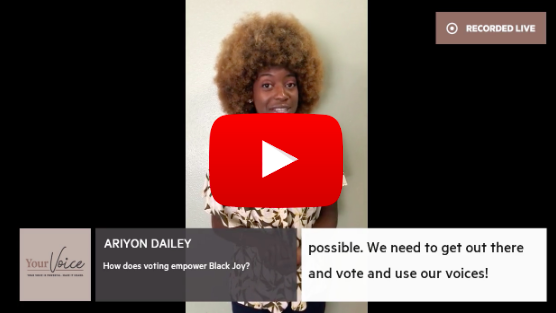 Throughout 2018, we’ve had some ambitious training, mobilization, and voter contact goals; but our most important goal has been this: to empower Black Joy. When Donald Trump won the 2016 presidential election, my heart sank. Racism, xenophobia, and other forms of fear-mongering were being used to rally millions on the far right, all at the expense of our freedom and well being. At that moment, I knew we as an organization had to do more. Black folks needed a political home that we could call our own. Where we could be our full selves, in community with each other, sharing and lifting up our stories for all to hear. Two years later, there is one thing that I know for certain. Not only is Black Joy beautiful; it is an effective force to build political power in Black communities. These are the numbers, and, while they’re important, there’s a larger story to tell as well. Here is how we accomplished ALL of the above. Last year, we did something we had never done before: we invited our members to the inaugural Black Women’s Brunch series in Detroit, Miami, and Las Vegas. Hundreds of people came together to share their stories and celebrate Black women and our experiences. Over the past year, 14,355 Color Of Change PAC members have come out to our Black Joy events. In total, we’ve had 87 events in 30 cities! Our Black Joy event series has been a testament to the collective power and brilliance of Black people. We created a space where Black folks from all walks entered into community with one another, shared their stories, and discussed the importance of the upcoming elections. At these events, we danced to the Wobble, took selfies at our Flower Wall, laughed until we cried, and built strong relationships by launching squads committed to mobilizing voters after the brunch was over. Stephanie, a voting rights activist, first heard about Color Of Change PAC when she received a text message from one of our organizers. The first event she attended was #ServeOurSister in Orlando, FL, where she helped create care packages for women like herself who had been through the criminal justice system. Later, in July, she attended a training camp with us in Jacksonville, where she learned important skills to mobilize Black voters across the state. Today, Stephanie loves canvassing. Since starting her journey with Color Of Change PAC, she has gone on to recruit and lead other members to canvass their neighborhoods, sharing their stories and turning out the vote. She and the rest of the Orlando Color Of Change PAC squad have mobilized thousands of Black voters by organizing phone banks, canvasses, and, yes, more brunches to train other leaders! We couldn’t have made such a deep impact in Black communities across the country without meeting folks like Stephanie in person, and inviting them into our movement. There are countless stories like hers. It’s because of volunteer leaders like Stephanie and supporters like YOU that we’ve knocked on more than 55,000 doors, made over 20,000 phone calls, and sent over 1.4 million texts this year. This year we accomplished our goal of mobilizing as many Black voters offline as possible. But we knew from the beginning that we couldn’t reach everybody at a brunch or a canvass. We knew we had to think strategically about how to reach voters online as well. And we did! Click here to watch the video and share the story of our work in 2018. AND we’ve already started to win key races! When I look back at the work we’ve done together, I can’t help but smile. By centering community and Black Joy, we’ve built an unstoppable movement. A “Black Wave” that’s already been out in force: canvassing, making calls, sending texts, sharing stories, and, most importantly, VOTING. No matter what happens tomorrow, what we’ve built together this year is beautiful and powerful. Regardless of who wins or who loses, I’m incredibly proud of our work. Let’s wake up on Wednesday morning ready to continue to do the work that our elders pioneered for us. Let’s continue the work to make justice a reality for all Black people in America. P.S. Text “VOTE” to 225568 to find out where to vote today and sign up here for our post-election strategy call. We’re already planning for what’s next and can’t wait to tell you about it and continue to empower Black Joy going into 2019 and beyond. Message and data rates may apply when texting. Editor’s Note. This letter from Color of Change PAC was edited ever so slightly to reflect the fact that Election Day 2018 will kick off later today, rather than tomorrow, in the United States. I was not paid to post this message. I did post it only because I am encouraged by grassroots campaigns like this, even when they are organized on behalf of a political party for which I have grown tired of voting due to the near-complete lack of viable alternatives. But even when a campaign like this is not ideologically perfect (what campaign is?) or might even fail (God forbid), it always serves as a tremendous school for the people involved in it, teaching them how to do the practical things all successful campaigns require and, more important, showing them that progressive causes advance themselves this way—as broad-based grassroots efforts that do not pull up stakes when an interim goal is reached or the movement encounters setbacks—or not at all. While I understand better than most de facto outsiders why campaigns like this are hard to mount in Russia at the moment, I also know the country’s police state regime is not the only barrier. Right-minded Russians often chafe at the notion of focusing on “boring” cool-headed, long-term planning and painstaking organization over spontaneous “popular” outrage. Even ensuring good turnouts at protest rallies by making grassroots organizers personally responsible for small groups of “passive” supporters (and, thus, personally responsible for turning them out to crucial events) seems like a waste of time to them. It is always easier to post a call on social media and then act confused when hardly anyone shows up. It is no wonder the only Russian word I can think of that would be the equivalent of “canvassing”—agitatsiya—sounds both terribly bolshie and wildly obsolete.